I have decided at long last I would put pen to paper and write a piece on my cars so now may be a good time to read something else! 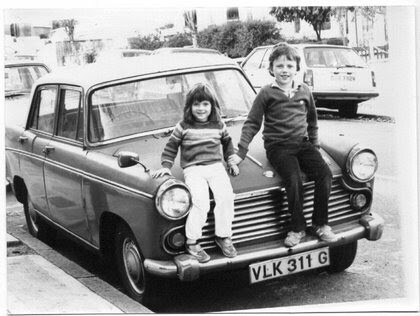 Austin Cambridge's and Morris Oxfords have always played a big part in my life my father having a Morris Oxford VI when I was young (VLK 311G is it still out there???) being the first car I ever went in. It took us everywhere including many holidays and days out and never gave cause for concern apart from on one occasion I remember when the head light fell out due to a rusty headlamp bowl. I have many happy memories of this car, using the pull down arm rest in the back as my own seat and also looking thought the drain holes in the floor at the road below as we was going along. I was also so impressed when my father used the starting handle to start the car a car that could be wound up I thought it was great that as well as the famous "OLD CAR SMELL!" had me hooked and was probably whets made me as mad about farinas as I am today. My Fathers car began to show its age and by 1989 was in need of fair amount of TLC an MOT failer prompted my father to sell it, by this time my father also had a 1971 Hillman Hunter DL BAR175K that was left to him in 1983 by my grandfather. 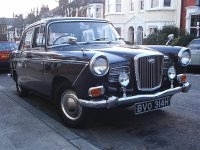 The Hillman, I am pleased to report, has been recently been passed onto me following my father giving up driving and I still use and enjoy it regulary. It needs some body work doing but still drives beautifully.While I have like Hillman Hunters I wanted an Oxford of my own after my fathers car went but still too young to drive. I had to wait and just look at other peoples parked at the side of the road etc. Fast forward to me being 16 and wanting a car ready for being 17. 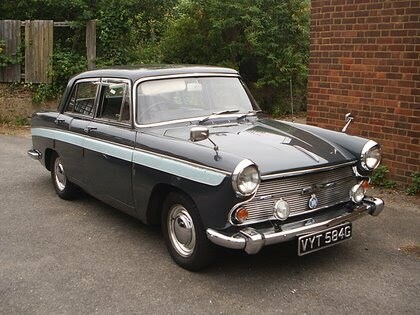 I had managed to get a Saturday job and was saving like mad I had also joined a couple of car clubs with the idea of searching for an Oxford or Cambridge my father suggested a smaller modern car but I want a farina and that what I was going to have no matter what. (dad later admitted he was glad I got my A60 because he still has a big soft spot for them as well!) 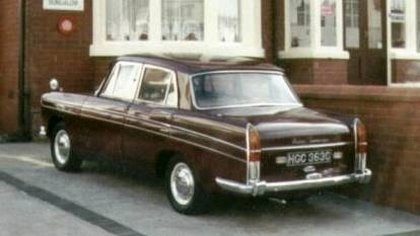 Anyway before long I found my self and my father stareing at what was to be my first car enter HGC 363C my dear maroon Austin A60 which I still have today her body work was rough but her heart was still good and still is today only ever needing routine work despite 200,000 under her wheels. We paid the asking price and the car was mine two days later me and my father went and picked her up (remember I still hadn't passed my test and was still 16 too young to drive) I will never forget my mother and grandmothers faces as we arrived home my grandmother said "why did you buy that its a bone shaker?" my mothers face was a picture my grandmother sadly never went in the car as she didn't like cars or trust my driving. So my 17th Birthday finally arrived and all I wanted to do was to drive my car so on the with the `L" plates and dad with his crash helmet. Here I was probably one of the youngest farina owners with his own car with `L" plates with a 1965 car in 1995. Anyway test passed a few months later and I was on the road. A full time job meant the A60 had some body work done the following year new sills floor panels etc and a new clutch and decoke then BANG - I managed to have a tangle with another car ( well people will leave them laying around!) not to worry not much damage to the a60 and soon back on the road again being used and enjoyed despite some funny comments form my mates who soon learned she was not such bad a motor after all. Fast forward another year or so and a phone call from my good friend Malcolm Padbury to tell me there was a Morris Oxford for sale near me that is being sold for parts may be of interest. So before the phone goes cold I am off to have a look at this car there before my eyes is a 1966 Morris Oxford Auto LLH 968D needed some glass as had a couple of widows smashed; a little rotten but too good to break I feel (grandmother, mother and neighbours where not so keen when I got home but hay that life isn't it!) This car was returned to the road with in a couple of weeks and I semi retired my A60 off into the garage I had got only using it in good weather letting the Oxford take the brunt of the hard work I never had any problems with my Oxford apart form the Auto box I had to have overhauled that was the only large bill in 4 years I had it. Sadly in the end somebody hit it from behind and pushed me into another car this caused a lot of damage both back wings and bent chassis rail and a nasty bash on the front wing. Sadly LLH 968D days were numbered, she could not be saved and was given to a mate to break up for useful spares. A very sad day indeed as I watched her taken away on a trailer. Also more bad news I had lost the garage for the A60 as well around this time. So what do you do in a situation like this?? Well, I had the insurance money so guess what I did? (not what grandmother and mother was thinking by saving it or something else no you have guessed it I went out and brought another Oxford!). Enter SFR 615J Morris Oxford beige with black interior I had known the car for quite a few years it belonged to a friend who had lost his storage for the car, the car had also run out of tax and test and was being used as a climbing frame for the local kids. It was only a matter of time before it would of been towed away as a dumped car. A bit of work later saw SFR back on the road where she still is today. I don't have any real history for this car I am told it on a Preston reg number if anyone car throw any light on her please get in touch. So now we are nearly up to the present day and I have just taken under my wing on his relocation to America Malcolm Padburys A60 VYT 584G Auto. It's a well known car and has been with Malcolm since 1973 It has a few extras and mods such as: Servo brakes, electronic ignition, alternator, hazard lights, hi-level brake lights, halogen head lights, Riley 4/72 seats extra lights....have I missed anything Malcolm? While I love the standard cars these extras have turned this into quite a car. I often wonder if BMC had developed the cars more would the production run of been even more? Or would we have lost the charm of the cars we all love? Well there you are that's my cars still being used and enjoyed everyday in this busy part of London. I don't attend as many rallies/shows as I would like but if you see me at any please pop over and say hello there's all ways time for a chat! Thanks must go to my dad, Malcolm Padbury, Ken Miller, Tony Michael and Smithy with whom my cars would not be on the road. 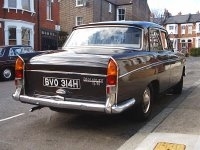 Well if you have not fallen sleep asleep safe driving and long live the Austin Cambridge! SFR 615 J my beige Morris Oxford has gone to live with Colin & Liz in Suffolk they will do all the stuff on it I couldn't do like an engine change and new floor pans and a few other bits and bobs. 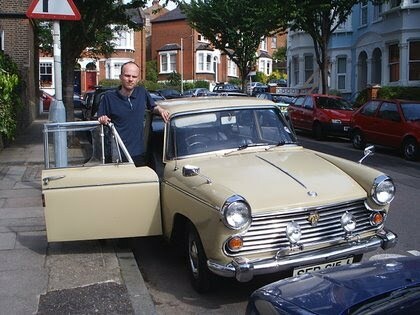 In return I now have one of their cars a Wolseley 16/60 of 1970 vintage in fawn brown with a dove grey interior. I am the third owner from new and she has her original engine, gearbox, starter, generator and clutch having covered 111,000 miles. The car was registered in Nottingham where it spent the first 17 years and has spent the last 19 years in Suffolk so the London traffic will be something new to it. She has also just come out of a 6 year lay up so is being treated very gently for now. Is waiting to have some metal work repairs before returning to the road. Our Hunter that's been in the family since it was 9 months old is still running ok despite laziness/lack of funds on my part for the over due body work repairs I hold my hands up this will cause the first enforced lay up ever soon when the body work/repairs are dealt with.